Sorry for not posting much lately. We're facing some transitions and it's keeping me busy juggling all of the various projects and responsibilities (Candy, I'm sorry, I think I killed your sourdough starter). On to recent projects. November has been much drier than October, so I've been out in the garden doing a little more work that often doesn't get done until spring. The boys and I have been cleaning, mulching and fertilizing the raspberries. To keep my paths clear in the raspberry patch, I put down a heavy layer of cardboard and/or newspaper and cover it with marsh hay or straw. To fertilize, I usually use aged horse manure from our neighbor (thanks, Ryan), but this year in addition to the manure we've got some worm castings from my nephew at Whitetail Organics. Soon it'll be time to bring in the last of the root veggies (carrots and beets) and store them in the root cellar, but for me they hold best in the garden until it gets really cold. I dig up a bucket or so at a time for a meal and a few in the fridge – or to ferment for yet another probiotic beverage. I've still got two batches of kombucha going strong on one corner of the counter, and I'll post about my flavor experiments with those later, but since I have plenty of beets I figured it was time to tackle kvass. Beets have a lot of health benefits, but I freely admit they are not my favorite vegetable. I grow them, we eat them, just not a lot of them. Pair that up with the fact that the mangels can easily grow to be around football size and not get fibrous, and that I grow red, golden and mangel beets, and you'll find that we usually have plenty of “excess” beets available. I haven't yet invested in a juicer, but I found this article on the health benefits of beet juice or “purple bull” as they called it, to be interesting. Beet juice increases endurance and can help to extend time of exercise by as much as 16%, a new study says. Nitrate that reduces O2 in the human body accumulates in beets. Reducing O2 in the body, this nitrate interacts with the muscles and heart in such a way that it allows for longer exercise and greater endurance. This is the case with both moderate- and high-intensity exercise. A recent study by scientists from the University of Exeter and Peninsula Medical School in Plymouth involving eight men between the ages of 19 and 38 found that men who drank half a liter of beet juice everyday for 6 days had significantly more endurance than the control group at the end of those six days. The authors of the study speculate that humans may have increased endurance from beet juice due to the fact that nitrates in the body transform into nitrogen oxide and this nitrogen oxide reduces the usage of oxygen in mitochondria. The authors say that such a reduction in oxygen usage could not be made by any other known methods today. So, I may be wrong, but I would think that you could get some of that same beety goodness from beet kvass, without the juicer and potentially in and even more readily absorbed form. Slice off the beet greens and save them for another purpose (beet greens are loaded with nutrients and can be prepared like chard or kale). Slice off the bottom of the beet and thoroughly scrub and peel. Coarsely chop the beets and place in a tall glass container. Add the filtered water, sea salt, and whey and stir to combine. Cover securely and keep at room temperature for 2 days, stirring a few times. 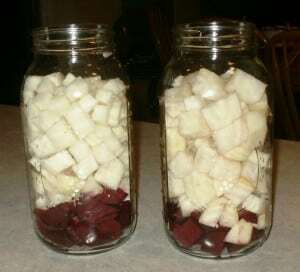 After 2 days, strain out the beets and discard, transfer the liquid to mason jars and store in the refrigerator. *Don’t use tap water if it is chlorinated because chlorine will inhibit the fermentation process. Spiritual food for the New Millennium CSA has some interesting variations for beet kvass on their website. I haven't tried them yet, I'm still sipping on my original batch, but in case you've got more time or even more beets than I have, check them out and let me know how it goes. Here's how my own beet kvass experiment played out. First, I needed whey. I dumped a carton of plain, organic, full fat yogurt in my jelly strainer and let it sit, covered with a dish towel, overnight. This yielded about a pint of whey and some yogurt cheese. I strained the thicker whey through a towel at the top of a jar. The yogurt cheese I used later like ricotta to stuff some manicotti. 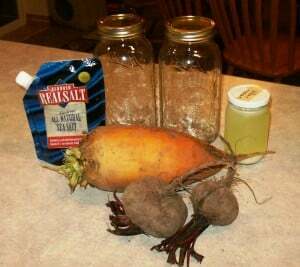 Once they whey was obtained, I grabbed a few beets and assembled the rest of my ingredients. That big yellow clodhopper in the middle is a mangel, the other two are an Italian heirloom variety called Paonazza D Egitto. Pack the beets in the jars. Add whey, water and salt, cover, mix well (I gave it a good shake) and place in a quite corner for a couple of days. To brew a second batch of kvass from the same beets, dump off part of the liquid, leaving a couple inches in the bottom, add more water, cover, shake and let sit for two more days. 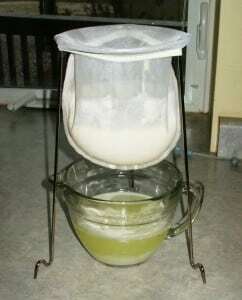 (The kvass left in the bottom of the jar acts as your starter instead of just the whey and salt.) Here's what the jars looked like at the end of the second batch. And here's what I ended up with in total at the end of the week. 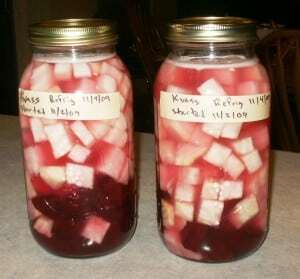 There are about four quarts of kvass and the leftover beets go in the compost pile. I'd have to say that I found the taste of the second batch better than the first. The first tasted more salty and earthy, like a really strong electrolyte drink. The second was smoother, more fruity, and more effervescent. They're all living in the fridge at this point as I drink my way through them, but I'm considering putting the earlier batch out at room temp to ferment a little more. The second batch is still quite active – I actually have to release the pressure regularly on the jars because there is so much gas buildup. As I've been digging a little more on probiotics, I've found that not only can they help you fight off colds and flu (see my Green Sense article on this topic), they can actually improve your brain function. I've seen other real food bloggers mention the GAPS diet, but hadn't looked into it much. I think after reading this article I'll be adding the book to my reading list. “Through studying the health of hundreds of patients with autism, learning disabilities, psychiatric illness and other problems, Dr. Campbell-McBride discovered that in all cases these children and adults had digestive problems, often of a severe nature. Through her research, she has determined that there is a distinct correlation between unhealthy intestinal flora, poor digestion and toxicity from chemicals created by undigested foods that can severely affect brain chemistry. She coins this as “Gut and Psychology Syndrome,” or GAPS. But what exactly happens in the gut that can upset brain chemistry? Dr. Campbell-McBride provides us with a magnificent explanation of the cascade of events that can occur when digestion is not supported by a healthy gut flora. A child or adult who eats a diet that is high in difficult-to-digest carbohydrates such as grains and processed foods, will continue to encourage the underlying condition of gut dysbiosis. Dr. Campbell-McBride states that people with damaged flora will even crave the very foods that support the survival of the unhealthy bacteria often to the exclusion and refusal of others. Where most research on poor digestion focuses on unhealthy intestinal flora, Dr. Campbell-McBride’s work uniquely points to many problems with gut flora actually beginning with an unnatural growth of the fungus, Candida Albicans, in the stomach when it is not producing enough acid. She discusses that this overgrowth interferes with the first step of digestion by causing the stomach to produce inadequate amounts of the hydrochloric acid necessary to break proteins into “peptides” before entering the small intestine. For instance, under normal circumstances, the gluteomorphine and casomorphine proteins in wheat and milk are broken down in the stomach in the presence of proper amounts of stomach acid. However, with less stomach acid, these foods in fact begin to ferment in the stomach and are not broken down into peptides before passing into the small intestine. Besides causing an inadequate digestion of foods, the pressure of the gas created from this fermentation can lead to acid reflux, esophageal problems and even hiatal hernias, which are some of the most common digestive problems that people experience. Undigested carbohydrates, poor digestion and candida overgrowth in turn result in the production of the chemicals ethanol and acetaldehyde, which have profound consequences on brain chemistry and development. With these chemicals, a person can technically be considered “drunk” after a meal of carbohydrates even though they consumed no alcohol. We all know that alcohol is extremely toxic, especially to a developing fetus or a child. Besides reduced stomach acid and pancreatic enzymes, the following are some of the effects of a prolonged presence of alcohol from an overgrowth of candida in the body: damage and inflammation to the gut lining and resulting malabsorption; nutrient deficiencies; stress to the immune system; liver damage; accumulation of toxins, old neurotransmitters and hormones that can cause abnormal behavior; brain damage that can lead to lack of self control, impaired coordination and speech development, aggression, mental retardation, loss of memory and stupor; peripheral nerve damage; muscle tissue damage and weakness; metabolic alteration of proteins, carbohydrates and lipids and pancreatic degeneration. There's a lot more to the review, but you get the idea. An unhealthy digestive system leads to unhealthy brain function. Maybe this is yet another contributing factor to the rise in autism, ADHD, depression and all the other mental health issues that are affecting our society today? We all know that drug companies stay in business by promoting the latest miracle pill, so you're not likely to see a lot of studies on this material, but I think it's worthwhile for us to do a little experimenting of our own and evaluate the results. The flavors are different than what we're used to, so it can be a little challenging to get the family to go along with the plan, but I keep experimenting and I know eventually I'll find options that they even enjoy. This food journey goes on one forkful, on sip, at a time. Weeeellllll, unless the family enjoys the taste of beets, it may be a stretch. So far I've got no takers, but I'm hoping to get some to my stepfather (he lives on the other side of the state) who is currently having problems with anemia. The first batch was very strong flavored, the second was much better, IMHO. The fermentation process seems to have created new flavor profiles, a little bit fruity and floral, less salty and metallic (less beety, if you will). My hope for a fermented drink that the family will enjoy is in water kefir soda. I have the grains, I just haven't gotten around to rehydrating them and brewing yet. Lately I feel like I'm up to my eyeballs in alligators, just trying to keep up with everything. I've done beet Kvass before but for my husband it's just to salty and he's on a reduced salt restriction. Months later I decided to try beet Kvass using Kombucha with it..figuring the probiotic effects of Kombucha combined with the nturient values of the beets would be great. I loved it my hubby did not. Link to my try is here @ http://seedsofnutrition.com/?p=399. Say don't toss out the beets after your brewing unless you really can't tolerate the thought of using them – on page 196 in Nourishing Traditions I took the beets after the brewing and made the Russian Beet Salad. It was delicious. Thanks for the study you shared on Beet Juice. I had never come across that one before in my online searches. Laurie, I really enjoyed this post. As someone from the South, I was never fed beets growing up. I only discovered beets when we started the GAPS diet and now I am a big fan. Beets with daikon radish are currently competing with garlic ginger carrots as my all-time favorite fermented vegetable blend. I like beets in soups, but they are the best for ferments. 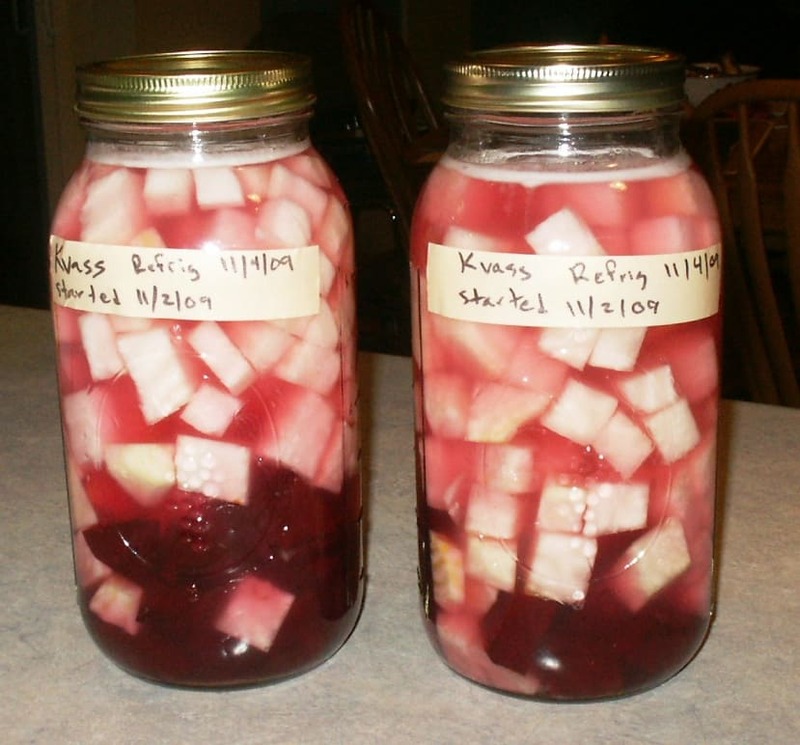 I can't wait to try this kvass recipe but my only source for beets right now is a grocery store and even there it is hit or miss. Psychic lunch did a post today on beet salad and I talked about them today in my post about fermented vegetables. Cool, huh? Both my teenagers love the carrots and neither ate pickles before. I think they are a perfect starter ferment for kids because most kids like carrots. Neither of mine will eat sauerkraut either. I have to say I much prefer kimchi to sauerkraut myself. Laurie ~ I see you have subscribe by email. But don't see a subscribe RSS Feed. Do you have one and I am just not seeing it? If you do I'll ad you into my RSS Feed roll for Real Food. Pamela – I think I figured out how to add it. Thanks for adding my posts to your mix. So I just started my own bottle of kvass fermenting. 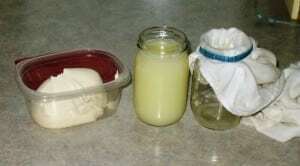 i am wondering if I have to start over with new whey after the two batches of kvass are made? Or can I use a bit of the previous kvass as a starter for the next batch? I am by no means a kvass expert, but I would strongly suspect that you could substitute 1/4 cup of kvass from a previous batch for the whey. After all, it would have all the little critters you're looking to grow. If you give it a try, will you post and let me know how it works? I LOVE BEET KVASS! What a great article! I really want to know where to get that cool thing you are straining the whey with, can you share, please? Dr. Catherine – Thanks for stopping by and thanks for your kind words. I just added an online link for the jelly strainer to the article. I picked mine up at a local hardware store during canning season and the price was similar (just under $8). 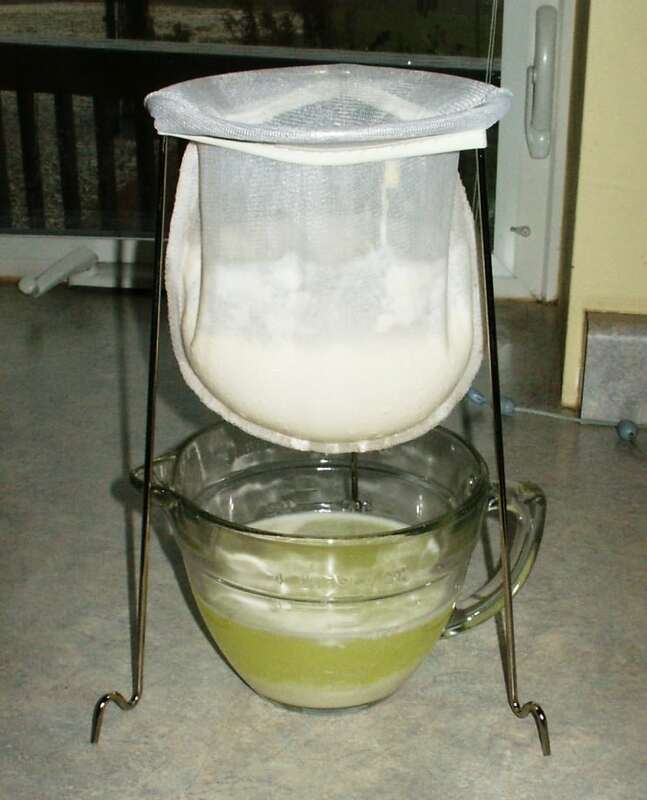 I use mine all the time for straining whey, straining jelly, straining chicken stock, straining herbs out of oil – you name it. Very handy piece of equipment, plus the legs unscrew so it can be put away flat, and you can get replacement bags separately when they wear out. The elastic on mine finally gave out last season after 5+ years of use. Thank you for this how-to! I am especially inspired by your large beets – the dog dug mine up halfway through the summer, and they were never the same when I tried to replant 'em. Anyway, thanks for the recipe and tips. This has been on my "things to try" list for a while now. One question though, why do you replace some of the kvass with water halfway through the fermenting process? Is it just to give it a milder flavor? I found you through Tuesday Twister, by the way. Uh-oh on the digging dog. The neighbor's dog ran over some of my melon transplants a couple of years ago, and they were never the same, either. I should have explained the liquid swap out better. The reason for it is to brew a second batch from the same beets. You pour off most of the first batch of kvass, but leave a little in the bottom of the jars to act as a starter for the second batch instead of just the whey. I did find the second batch to be milder in flavor, but that's just a bonus.